The veil has lifted and the 2017 KTM Dukes are now out in the open. 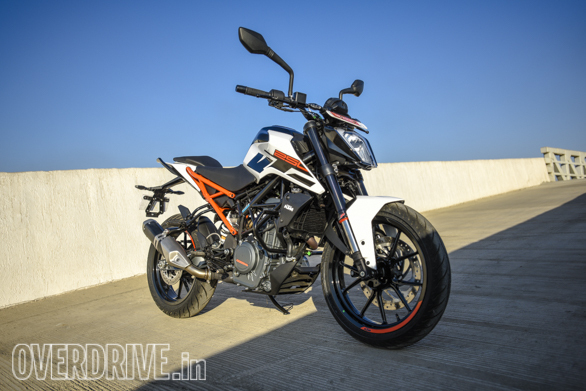 As you know already, the 2017 Duke like up now consists of three KTMs, all built at Bajaj's Chakan plant near Pune. 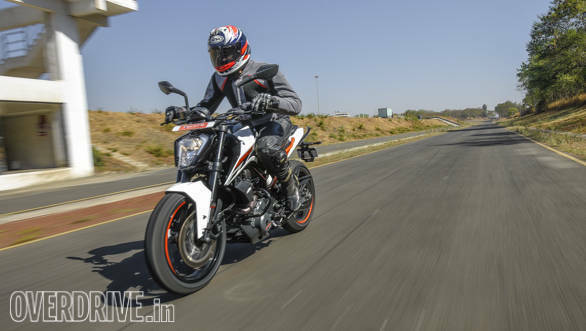 We got to test ride two of the three motorcycles so far, see the separate story for the KTM 200 Duke. This story focusses on the new entrant into the line-up, the 2017 KTM 250 Duke is brand new and in some ways it is a parts-bin special. The Rs 1.73 lakh ex-Delhi motorcycle has the tyres, brakes, meters and electronics similar to the 200 Duke but it gets the design, (base) engine, wheels, frame and suspension from the 2017 390 Duke. And don't think parts-bin special means it's a product you can dismiss - here's why. I know it looks smashing in the pics but in the flesh, the KTM 250 Dukes even more special. The bodywork and the beaky headlight make the motorcycle look lighter and smaller from the size while the flat planes and sharp edges clearly mark out a Kiska design. 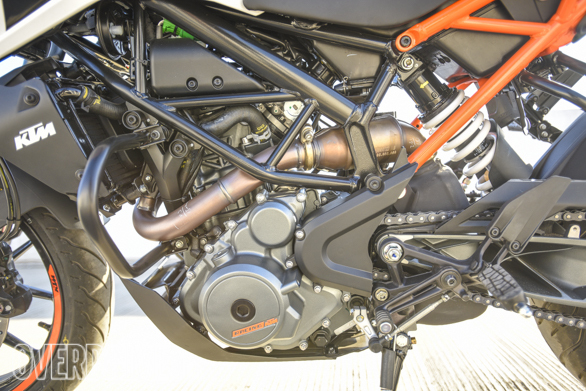 The SuperDuke inspiration is obvious but the effect is of a more upmarket, slightly better-finished motorcycle. The steel tank is also a good thing in my book. I don't mind plastic tanks and all that to be honest. It is the additional capacity that excites me. A 13.5-litre tank means more miles between fill-ups and that is a big deal on highway runs in terms of time. If you've done trips on the Duke out on the highway, the additional 3-odd litres will make a substantial difference. The third thing in the design is that while KTM has maintained the original dimensions, the design permits a longer rider seat. But that combines with the new tank extensions which run forward right to tip rather than branching out like the 2016 Dukes. This means you have ample space to slide forward and back and squirm about if you need to. A slightly softer foam completes what promises to be an effective, and this time around, more spacious but still compact motorcycle. I saw an indicated 141kmph on the test which means 110kmph cruising on the highway should be sweet on the 250. The 2017 KTM 250 Duke looks sharp and fresh from every angle. From this angle though, the thing that sticks out is the new side-slung exhaust. KTM could have styled it to look more like an OE unit. It sounds like the old KTMs did and the change in sound is relatively small. The new 250cc engine is based on the new KTM 390 Duke engine. This brings a noticeable improvement in both torque and refinement. And both changes are welcome. The 250 Duke goes quiet and smooth from 4,000rpm to 8,000rpm in ways the old KTM engine just couldn't. This brings a level of smoothness that I think a lot of people who found the old KTMs a little too frantic and angry-sounding will think the 2017 KTMs are calmer and sweeter and perhaps more to their liking. You can rev out the 250 to the redline if you like. Peak power is 30PS but it arrives at 9,000rpm, a full 1,000rpm earlier than, say, the 200 Duke. Similarly, peak torque - 24Nm - arrives at 7,500rpm, 500rpm earlier. Riding out on track I was happy to rev to the redline in the few corners at the Bajaj track where shifting up a gear momentarily before a corner entry would be a waste of time. But you rapidly learn that unlike the 200, extracting performance on the 250 isn't about revs. You can shift up at 8,000 or 9,000rpm and not lose significant momentum or acceleration. That is quite the change of pace because it means that you can ride the KTM 250 rapidly without it feeling frantic or like a blur of gear changes. At slower speeds too, the KTM 250 has roll-on acceleration where the old Dukes would have demanded a downshift or two. Also helping here is the slipper clutch which reduces the clutch effort notably. 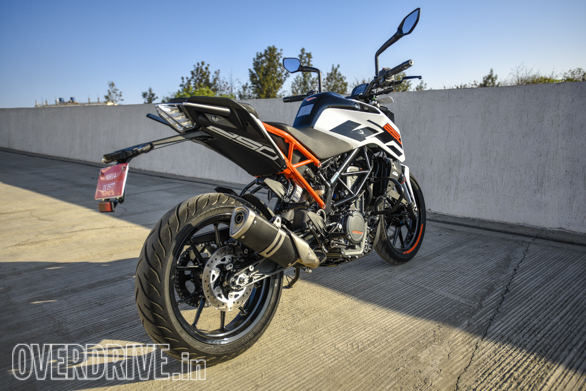 KTM is not claiming numbers at this time but the KTM 250 Duke feels fast and responsive just like the old Dukes except that its raw enthusiasm has been smoothened off and it feels a bit grown-up. The chassis itself has not changed in terms of geometry or wheelbase. So the feel of the KTM 250 Duke is actually quite familiar. But once again, you quickly notice the extra suppleness in the suspension. This is the new open cartridge front fork and the new rear monoshock at work. I went over a few bumps and it appears that the suspension is able to absorb sharper bumps vastly better than the old ones while showing a sophisticated control over chassis pitch and attitude otherwise. We will verify in the road test when we ride the bike in the real world, but the suspension gives the KTM 250 Duke a sense of refined control that the old one did not have. This means ride quality should feel better by a significant bit while mid-corner bumps are dealt with smoothly. The MRF tyres are very good overall though not as grippy and feel-some as the Metzelers which will be standard on the 390. What that combines into is a very sharp, responsive motorcycle with reflexes, ability as well as grip. You can corner the KTM 250 Duke very hard indeed. And the level of confidence will be higher than the outgoing Dukes. To me, this is the weak spot of the motorcycle. The 300mm front disc is shared with the 200 Duke. It feels adequate on the 200 and it just about handles the 250's additional performance. I would have liked a lot more bite. The problem is not outright brake force though. The problem is that hard stops or shedding a lot of speed into a slow corners needs four fingers, all working very hard to access the brake force. It's not in sync with how effortless and light everything else on the motorcycle feels. 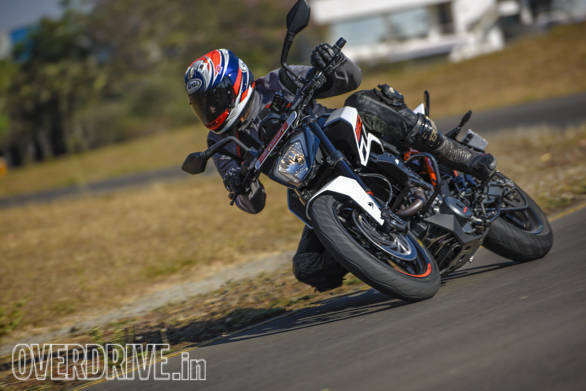 The KTM 250 Duke didn't blow me away with its performance, let us be honest. But I do believe it will sell rather well and that this is a solid, solid addition to the KTM Duke line-up. The Rs 1.73 lakh ex-Delhi buys you the smoothest KTM we have tested at this point. And it retains all the things we love about the Duke - the willingness to be very naughty, the lightning reflexes, and the all-round blend of engine and chassis performance. 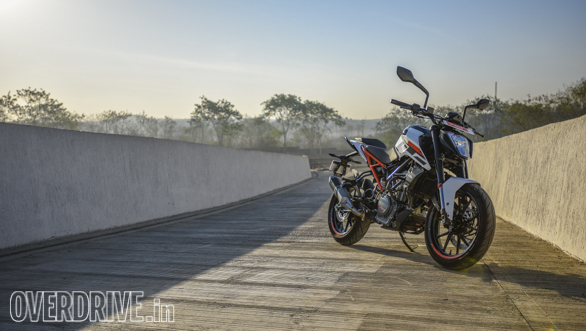 The 250 Duke also throws light on how KTM has evolved the Duke. From the raw energy of the first-generation Dukes, this one has grown up and gained more ability and appeal. It's smoothness will bring new customers. You can ride it very hard at the top of its revs and now you can also go very rapidly using its mid-range. That means the KTM is now a more flexible motorcycle and more people will probably take a liking to it. We do wish that KTM had made ABS at least optional and we think the brakes still need more tuning to match the motorcycle's feel. But all in all, the KTM 250 Duke is a sweet, promising motorcycle. 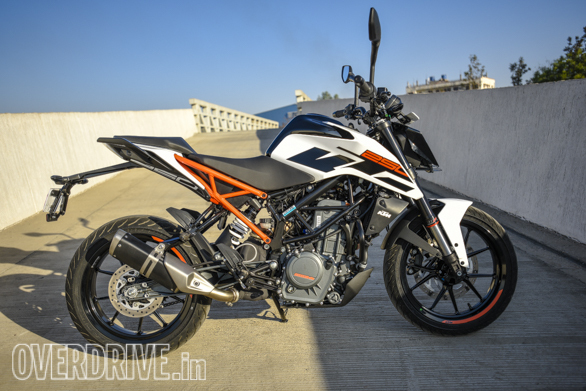 Promising enough for me to encourage everyone considering the frantic 2017 KTM 200 Duke to see if they can find Rs 30,000 that will get this the 250 instead of the 200.